Meet Oscar. He’s the newest addition to our family (a very welcome gift for our three-year-old from Grammy), and he’s a 13-week-old Blue Point Himalayan cat. He’s also spoiled rotten, but can you blame us? I mean, look at him. He’s adorable! And so are our other 3 furbabies. Below are Bocca and Harley (both rescues). And Ali, our purebred boxer. Yes, they are sharing the dog bed, holding paws. Oh my heart! Oh, and another thing about canned cat food: Cats don’t have a natural thirst drive, which means they have to drink lots of water if they’re on a dry food-only diet. The only problem is, drinking water doesn’t come naturally to cats, and many don’t drink enough of it, which can lead to kidney and urinary tract problems. Wet canned food, on the other hand, is loaded with moisture, which means cats get more of the water they need simply by eating, which is how cats in the wild get most of the water they need, too! Of course, our little fur balls don’t care about things like responsible sourcing, but it matters to me. All they care about when it comes to food is taste. And as you can see from the photo below, Oscar definitely approves! (His favorite is Sheba’s Chicken & Liver entrée.) The other two are big fans as well! And of course, the pooch looks on, hoping for some wayward crumbs. For more information about Sheba, including a listing of all flavors and varieties, check out their website (while you’re there, don’t forget to grab the Buy 6, Get 1 Free coupon!). Also feel free to follow them on Facebook for news and updates! I love the names you picked for your cats, and it was a treat to look at all this cuteness! It can be a challenge. The best advice I can give anyone is to read labels and avoid corn and rice fillers. I also do a lot of research on pet food. It is really important to feed them the best food, at least in my opinion. I love the pictures and the one with the cat and dog holding paws is so cute. Oscar is adorable. I have a dog. It is amazing what is in dog food! SCARY! Kingers only eats high quality natural food. I believe we are what we eat and that goes for animals too! Love the pictures of the puppy with the kitty <3 So cute. We're a dog family though my 8yo dd would love a cat! Oh, she is so adorable! I love cats too and yes, they really need to eat healthy food. Your cat is SO fluffy! I sooo want a cat like that. I don’t have any cats so I haven’t looked into cat foods too much but after getting a dog for the first time about 3 months ago ive been shocked at the quality difference between brands. Reading ingredient labels is a huge eye opener. It really is amazing at the difference! Super cute! I used to have a brother and sister cat pair. We got them as kittens, they were siamese, blue point, snow shoe cats. The male Stormy was all gray short haired with blue eyes and white paws. The female Sky was fluffy haired, blue eyes, and snow white paws. She hated humans, he loved humans. Awww! Himalayans are part siamese, part Persian, so they have a little bit of the Siamese personality. I love it! Yep! It would be like eating sugary cereal or fast food for every meal, every day of your life. You’d be fat and sick. No fun. She is so cute! What a beautiful cat! Oscar is a gorgeous kitty! He looks like he’s really enjoying his meal in that last photo! That has to be one of the cutest cats I have ever seen. 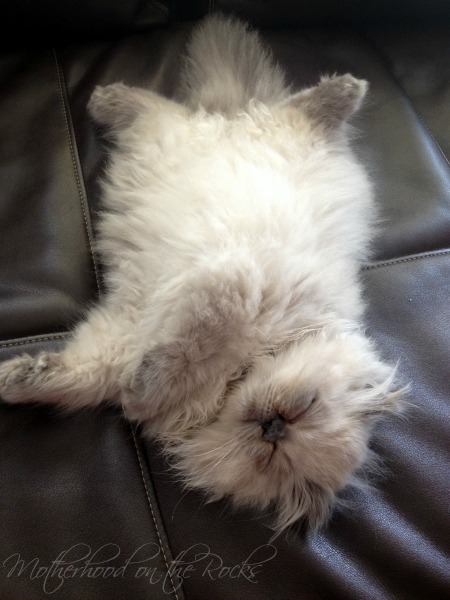 I love how fluffy cats like to lay on their back and stretch out. It’s one of the cutest things ever. I’m not usually a big fan of cats, but these photos are melting my heart right now! Congratulations on bringing home a new fur baby! And good for you for ensuring that your pets are eating well. I feel like so many people just feed their pets whatever is cheapest without giving much regard to their health, so it’s refreshing to read that you aren’t following that route. Aw! He is such a cutie! We have three cats as well, two of whom are rescued. They have to eat a special cat food because one has a grain allergy. Oh my!!!! I think that is probably the most adorable fur baby that I have ever seen!!!! What a fancy cat! 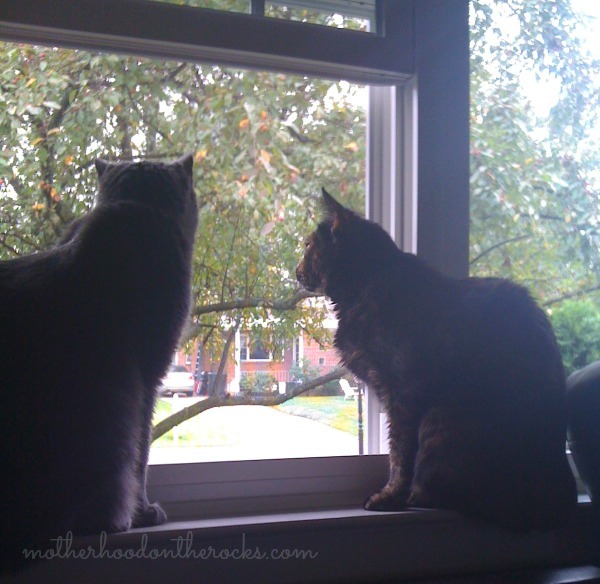 My boys won’t go for wet food, we just stick with cans of whole white tuna. Those are great pictures! I miss having a cat. Unfortunately we had to give him up after the birth of my second son who had a sever asthmatic reaction to him! I agree with you that healthy cat food is needed from Kittenhood until adulthood! Aww she is so adorable. I just love your photos. I am a sucker for any photos of pets and yours are adorable. I am going to check out Sheba for my kitty. Love the dog overlooking the cats. Everybody needs a guardian like that! Love Your Beautiful Cats, Your Such A GoodMomma!!! Congratulations on your new cat! I didn’t know that about cats not wanting to drink water and I’ve had cats my whole life. I’ll have to take that into consideration when feeding Missy. Awww, what an adorable cat. We are definitely more of a dog house but I love seeing pictures of kitties. Such a cute, fluffy kitty! We recently got a new kitten too.. He’s growing so fast! I completely understand doing research to find the best food for them, I know I did! Awww… lovely! Just like any parent, you want what’s best for your baby. So I’m right there with you about healthy food! Oscar is absolutely adorable! We just added a new addition too and feed him the best we can. You dont realize what “stuff” is in most cat foods, gross! You have very beautiful babies. I love animals. I have to make my cats food because of dietary issues. That is a georgeous kitty. I love that your kitty is an absolutely fluffball. It’s so great that your dog is kitty friendly! I am a dog person, but that cat is stunning. 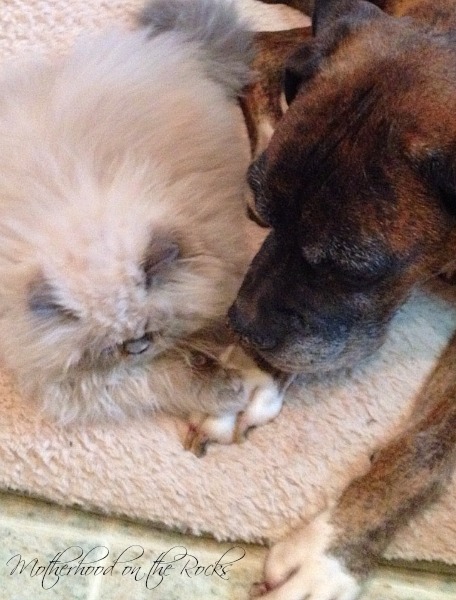 You are so lucky to have Oscar – and I love that he and Ali are friends!! Love your furbabies!! So cute! 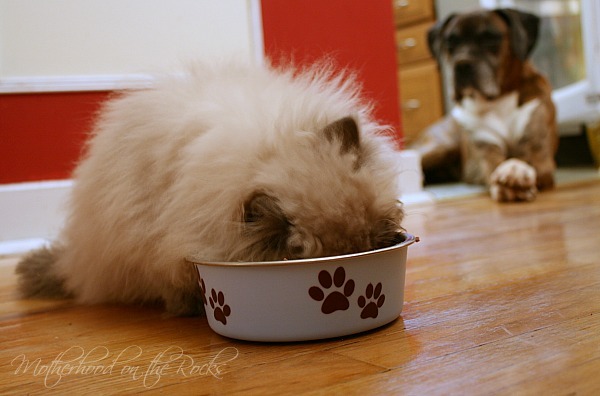 LOVE the pic of the kitty and the doggie – so cute! When my cat was alive I used to feed her this brand as well, she loved it! Sending this on to my cat lover friends! Ok that is the most adorable kitten I have seen in a long time. He is too freaking cute. I like cats but am allergic to them, my daughter is dying for a cat but she will have to wait until she moves out as I can not have one in the house but thanks for sharing the adorable pics. Makes me sad I can’t have cats though. I love all the cat pics! We can’t have cats due to allergies but yours are adorable and seems to be well loved! I’m allergic to cats, but I think they are so cute! Your animals are super cute, and sure seem to enjoy their Sheba! Congratulations on the new addition to the family. The kitty looks so soft an cute and just lovable. Yikes, I didn’t realize there were all those fillers in there. That’s no good! 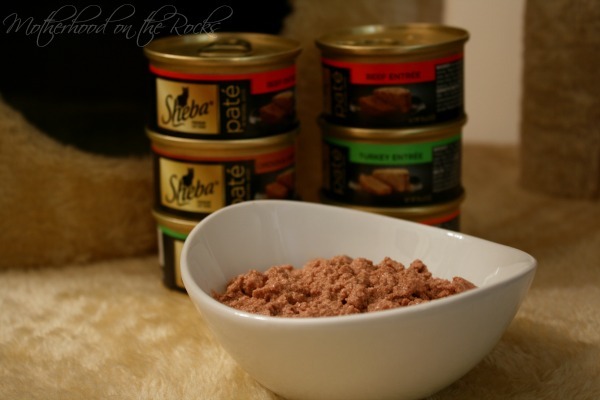 Yay for Sheba cat food! Looking at all this cuteness has made me so jealous! I so want a cat. The last picture looks like he passed out In the food bowl. Poor little guy. what an adorable ball of fluffy cuteness!! Love it!! What sweet animals. I know my cats are ling their Sheba and it makes their coat shine. such an adorable furry cat! my parents have a cat and they only give him wet food. Oh my goodness, how cute! I’ve always had cats, but never tried wet food for them. Your cat is so puffy. I want to hug him and squish his puffiness!! !